Elf the Musical opens Nov. 23 at the Spokane Civic Theatre. Last year, in a slight departure from recent tradition, the Spokane Civic Theatre mixed things up by putting on a holiday production that was neither White Christmas, The Christmas Schooner nor some variant of A Christmas Carol, at least one of which had been performed in nine of the previous 12 seasons. Instead, the theater opted to stage A Christmas Story: The Musical. Kathie Doyle-Lipe — herself a front and backstage veteran of dozens of Civic musicals and dramas — directed. 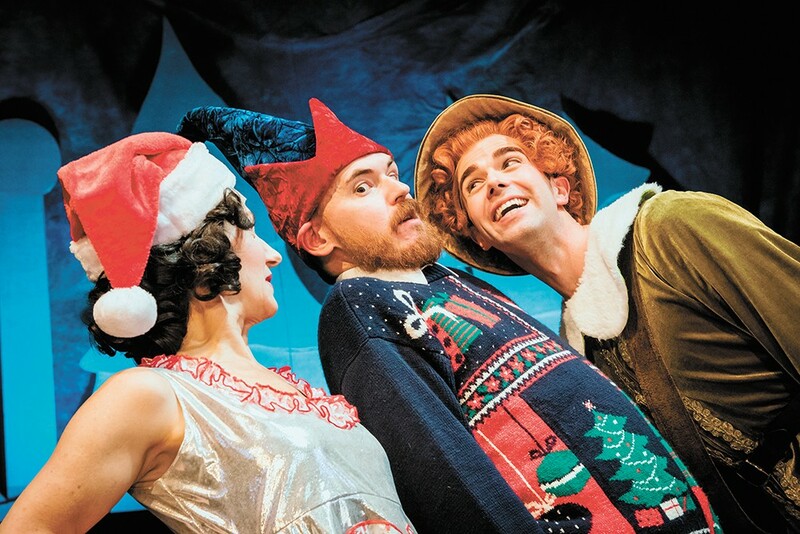 This season, the Civic is continuing its controlled drift into previously uncharted, snowy territory with Elf the Musical, a show that's not only new to the venue proper but to the entire Inland Northwest. Look a bit closer, though, and you might spot more similarities than differences. Like A Christmas Story: The Musical, Elf the Musical is a relatively new screen-to-stage adaptation of a much-loved eponymous holiday film. That invariably lends both shows a fresher, more contemporary energy than, say, Charles Dickens' Victorian England or Irving Berlin's postwar America. Doyle-Lipe is also returning to direct, where she'll have to walk the same creative tightrope as last year. "You pretty much have to create a different animal" to the original film, she says. "But you have to take the movie and try to stay true to it. It worked incredibly well with A Christmas Story, and I think part of that is because we were able to have all of the characters, even the dog. And the tunes in that one — it all seemed better suited to a musical than a movie. Whereas this one (Elf) reminds me of more when I did Wizard of Oz." She cites the "magic" of Elf in making that association. Even when translated to the stage, both films call for sweeping set changes and fantastical elements to tell their stories. Barebones minimalism isn't really an option. "The scene changes in this one have made it a real bear. To get from an office with 10 desks to Macy's in 20 counts of music, you can't just yell, 'Cut!' We have to start the next scene when we're ready, so it's a lot of work," she says. Floating across the ocean on an iceberg as the Northern Lights swirl in the sky or watching Santa's sleigh rocket through the streets of New York are likewise tough visual feats to pull off, though Doyle-Lipe, not wanting to give away any Christmas surprises, hints that she and the Civic's experienced design team have come up with fun and often impressive methods. Longtime set designer David Baker, for instance, has created certain backdrops that work like folding fans, allowing for new scenes to spring up almost instantly. Doyle-Lipe is also tasked with choreographing Elf, and coordinating the relatively large cast in key scenes has been equally involved. "It's a lot of bodies to move around," she laughs. "Another scene that's been interesting, not just with bodies but how to stage it, is when they go to Rockefeller Center. How are you going to put an ice rink onstage? So we've come up with our own rollerblading solution." Yet sets and dancing, however showstopping, can only carry a production so far. With this particular production, which, paralleling the movie, centers on elf-raised Buddy and his fish-out-of-water quest to reconnect with his human father in the big city, the title star is likely to be the biggest draw. "Buddy's spirit is just the main focus of this show, as it should be. He's just so loving. He might say something strange because he's not the most socially adept person in the world, but it's never with a mean spirit," she says. And Seth Flanders, who plays the lead, is "so Buddy-like" in real life that Doyle-Lipe thinks that his good-natured enthusiasm will be as infectious as the Christmas cheer Buddy famously tries to spread through song. Elf is Flanders' first lead role at the Civic. He previously appeared there in 2015 as a part of the ensemble in the Jean Hardie-directed White Christmas. Doyle-Lipe, incidentally, played the general's housekeeper Martha Watson in that production. "Way back when I was an ensemble member, I felt incredibly welcome, and I think that's what gave me the confidence to come back and want to audition for this piece — just knowing how well the ensemble was valued and needed," he says, adding that that unique camaraderie is mirrored in Elf. "Even though Buddy the Elf is onstage a lot of the time, what makes the story so beautiful is every other character's journey along with Buddy. It's so necessary for everyone who's onstage to be there, even if it's just a quick interaction. It wouldn't be the story that it is if it weren't for every single person who's there and has those moments. And so I'm just incredibly thankful to be with a cast, a production team, a director that doesn't take those little moments for granted." Along with Flanders, Doyle-Lipe says that the Civic has been lucky enough to score other role-perfect cast members, such as Kim Berg, who as Santa Claus "looks like he just walked off the pages of 'Twas the Night before Christmas." There's also Emily Gjovik, who plays Buddy's disenchanted love interest Jovie. "She's a strong actress and she's got a great little voice. Her song, which is very fun, is called 'Never Fall in Love with an Elf.' You've got to like her, but she does jaded very well. And then she softens up at the end when they're together," Doyle-Lipe says. In that way, some of the finer points might deviate from the movie, but both Flanders and Doyle-Lipe are confident that the audience will take Elf on its own merits as a musical and, most importantly, as a feel-good, family-friendly reminder of the spirit of the holiday season. The original print version of this article was headlined "Innocence and Experience"